Frequently, we encounter customers who are considering developing their own chat logging tool for IBM Sametime, or they are using a product that has been discontinued or is facing 'end of life'. At Instant, we have been updating our Sametime logging and Sametime compliance application since 2003 and we are happy to announce our latest release. IMtegrity 5.2, our chat logging solution for IBM Sametime, includes several customer focused enhancements as well as improved support for Sametime 8.5. In our continued commitment to Sametime 8.5.x, IMtegrity 5.2 includes all of our recent improvements for the Sametime 8.5 platform. Real-time chat rules and disclaimers now work with IBM Sametime configured for LDAP directories. Fixed an issue with attachment file names containing two exclamation marks, like "theReport!!!.xls." We continue to see customer interest in the Sametime 8.5 platform and our latest updates to both our installer, and our real time chat rules and disclaimers should provide a compelling platform for customers who require Sametime chat logging. For our existing customers, we are eager to hear about any new product enhancements or feature requests. Thanks for reading - please contact us with any questions or for a free evaluation. We have recently updated IMtegrity, our chat logging solution for IBM Sametime, with several customer focused enhancements. In our continued commitment to Sametime 8.5.x, IMtegrity 5.2 includes all of our recent improvements for the Sametime 8.5 platform. 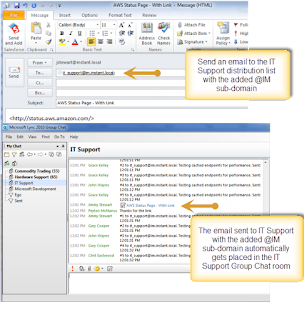 The @IM - Email-2-IM Gateway for Microsoft Lync improves enterprise email and instant messaging communication and collaboration. Businesses consider email and IM as their two most dominant forms of communication and the Email-2-IM Gateway cuts through the clutter and bridges your enterprise email and Microsoft Lync environments. The Email-2-IM Gateway merges enterprise email and Microsoft Lync instant messaging with the simple @IM sub-domain. 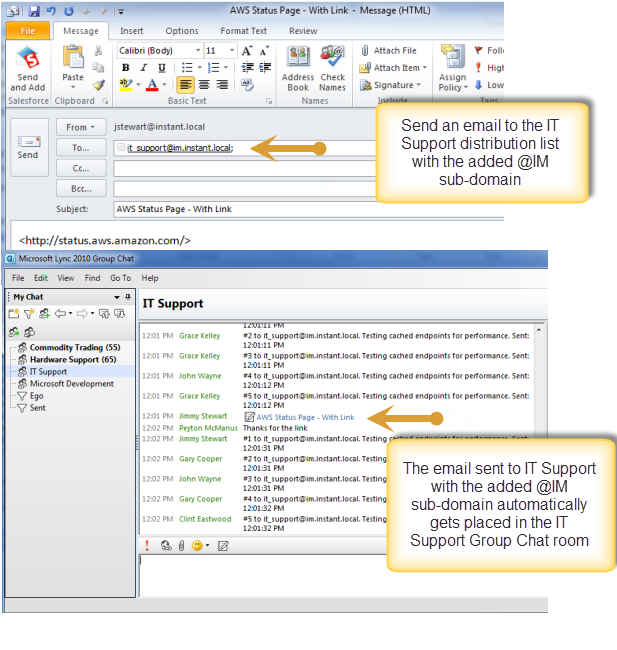 The Email-2-IM Gateway provides the ability to receive emails using Instant’s gateway server, and dispatch Lync IM messages to individuals, distribution lists, and Lync 2010/2013 group chat rooms. The application provides a solution to enable existing email notification systems to dispatch messages to Microsoft Lync IM users and Microsoft Lync Group Chat rooms. The Email-2-IM Gateway is a simple drop in application that merges email and Lync environments. Your existing automated email systems can now send IM’s and post information to chat rooms – including file attachments. By using your existing email client and adding the @IM sub-domain you can now notify more individuals and groups without added effort and with advanced communications tools.